Right after purchasing a brand new backpack for my son his preschool teacher informed us that they prefer the kids to use tote bags. Wah-wuh. Of course the reason behind this preference is more than perfectly acceptable- it helps the little ones get their precious artwork home without crumpling it all up. Ok, I get it. Backpack goes in the return pile and tote bag search begins. I figured a quick trip to Target and we would be all set up. Unfortunately all the back to school stuff has been replaced with Halloween décor and costumes, so we were out of luck. Then I remembered I had some castoff tote bags hanging out in my purse bin just waiting to be used. After some digging I found just the right bag. The first step was to neutralize the advertisement and add a personal touch. I dug around my fabric stash to find something that would coordinate. All I could find, that was not too girlie and in the same color family as the base bag, were these two cotton bits. 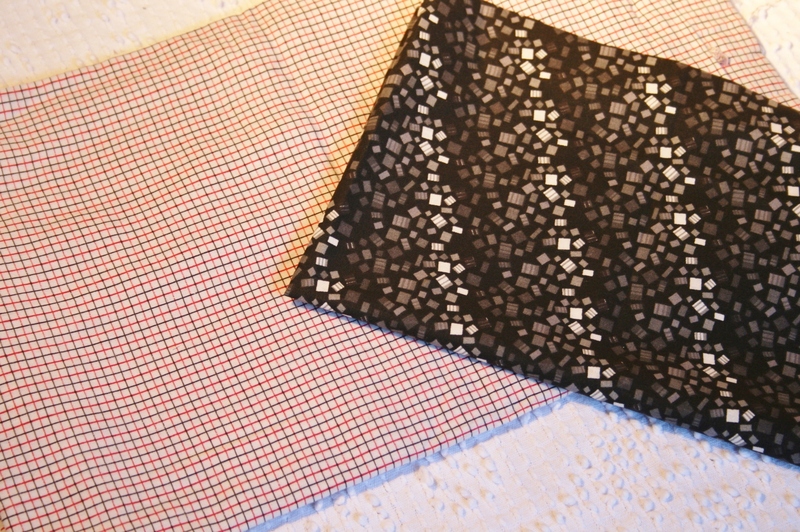 The black and gray geometric patterned piece is a newer purchase for another project and the red, black and white checkerboard piece was from my vintage pile. 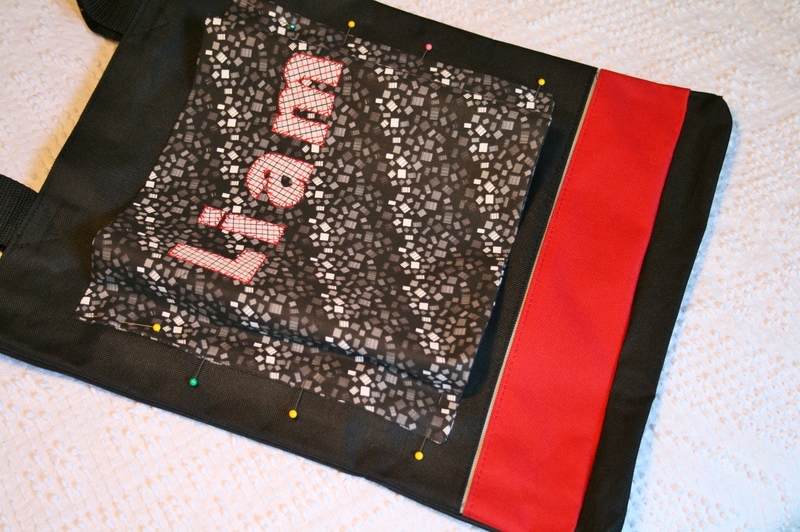 The base tote bag is just a simple sack, so I decided to add a large pocket on the outside, not only to give more storage options, but to also cover up the advertisement. Since everything that goes into my Little Guy’s classroom needs to be labeled with his name, I decided to add a monogram. I usually have luck finding just what I need for a monogram guide in Word. I used the simple block style font call Franklin Gothic in about size 48, typed his nickname across the page in landscape format and then printed it out. Next I ironed the lighter colored fabric smooth and added a scrap piece of fusible webbing to the back. If you forget to print the monogram guide in mirror image, like I did, don’t worry. Just use a sunny window for tracing. I flipped the paper with the name over backwards before I got started. Then I sandwiched that monogram guide between the window and the light patterned vintage fabric with the fusible webbing. 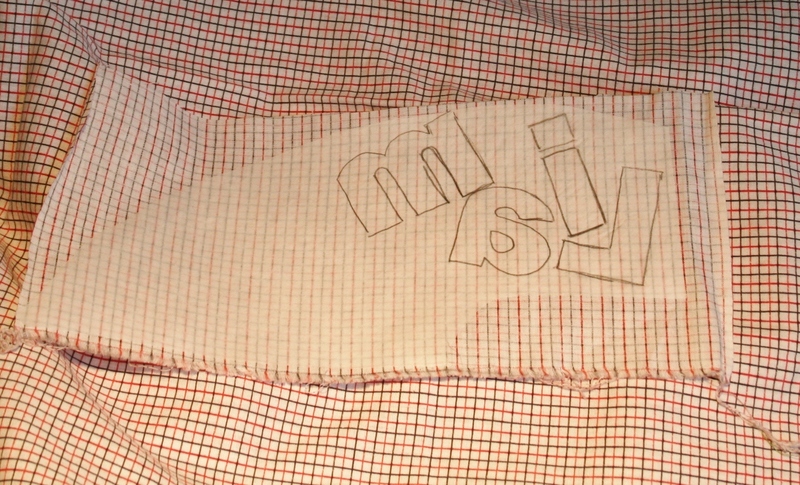 Because the webbing has a paper backing, you can just trace the letter outline directly onto the back of the fabric. 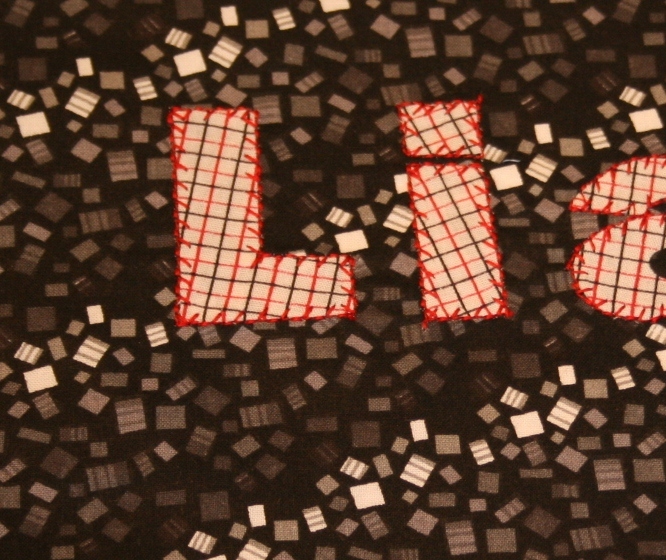 To conserve fabric and to switch up the pattern a bit, I shifted each letter before drawing the outline. That way the checkerboard pattern had more play once in place. 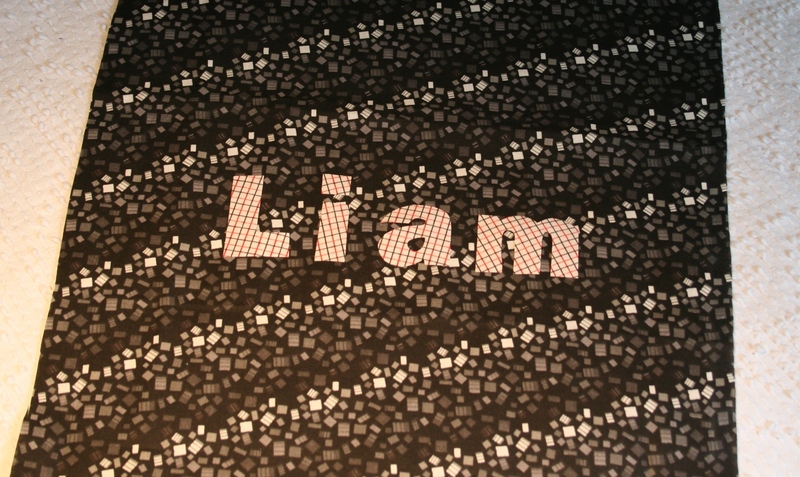 The next step was to cut out each letter and position it on the front of the darker base fabric. The idea here is to cut the base fabric into a rectangle shape, which will be folded in half with the fold at the top edge of the finished pocket. Keep this in mind when positioning the monogram letters. 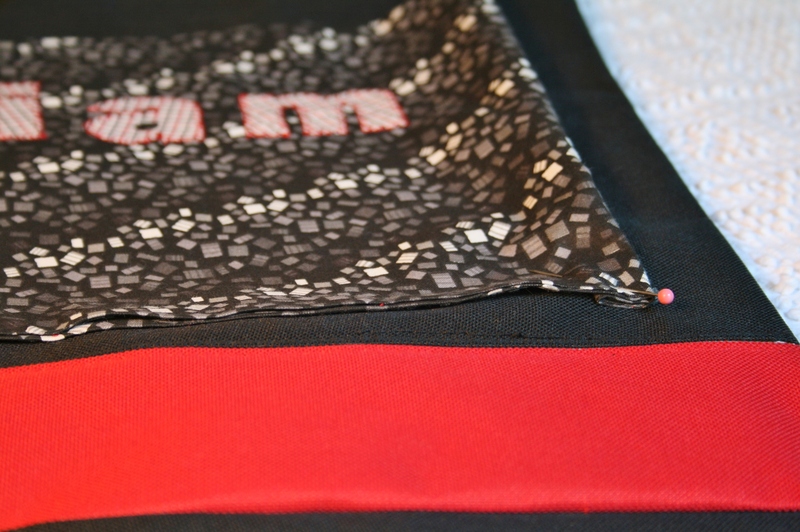 They will need to be close to the middle, but spaced accordingly to allow for the folds and side stitches. I actually folded the rectangle in half so I could get the best layout prior to ironing the letters in place permanently. 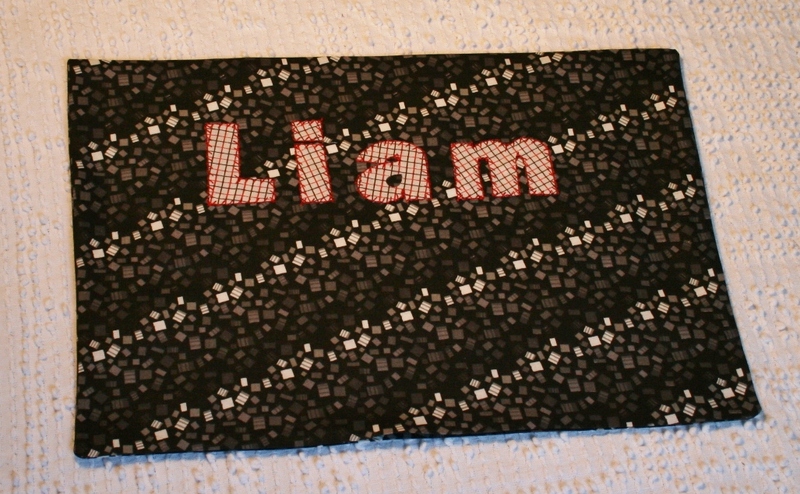 Using the feather embroidery stitch on my machine I outlined each letter in a deep red. 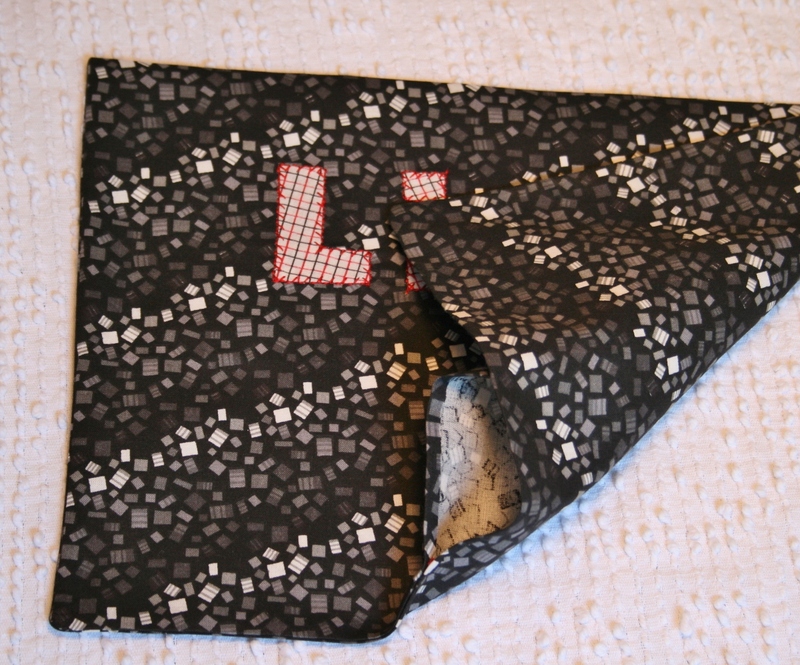 Next I folded the darker base rectangle shaped fabric in half, right sides together and stitched around the open edges. I was sure to leave a small opening in the bottom so that I could pull it right side out once I was finished with the sewing. Also, be sure to cut across each corner before pulling to the right side, so that you can get nice, pointy corners on your finished pocket. 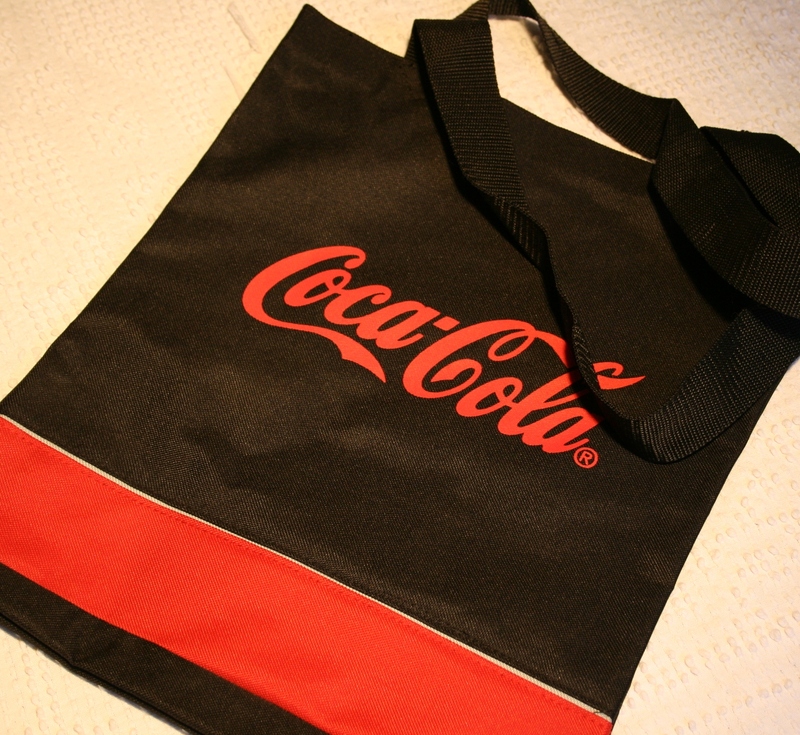 The next step was to position the pocket on the front of the tote bag and over the advertisement. Because I wanted a small amount of room in this patch pocket, I left a couple of inches extra in between each side before stitching the sides in place. Note: If you have trouble sliding the finished tote bag onto your sewing machine arm, you may have to rip out a side seam and reconstruct the bag after attaching the pocket. 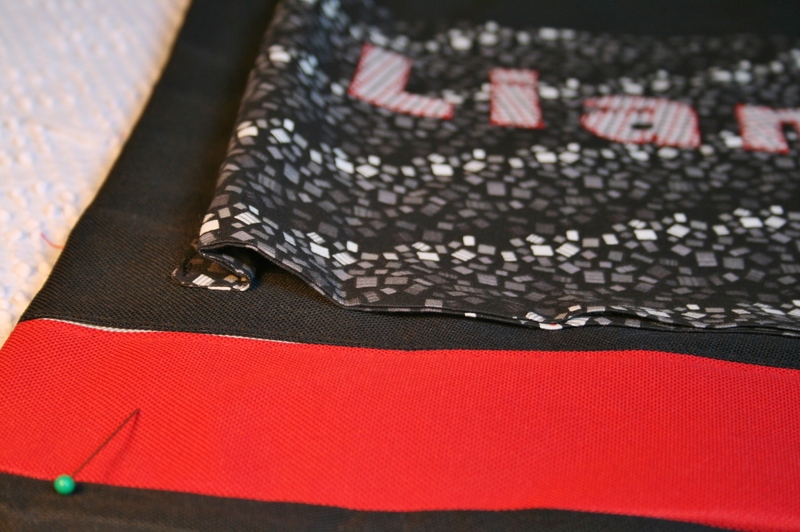 I added a fold at each side of the pocket and pinned it in place before sewing the bottom seam down. Also, I made sure I stitched close enough to the edge to catch the opening of the pocket that was used to turn it right side out. At this point the bag was finished. Although, I found that the pocket had a tendency to hang open exposing the advertisement after all. So, I added a thin, inch long strip of black Velcro to help hold it into place, especially when the pocket is full. This project was officially deemed a success yesterday when my son took in with him on his first day of preschool. Even the bear agreed. 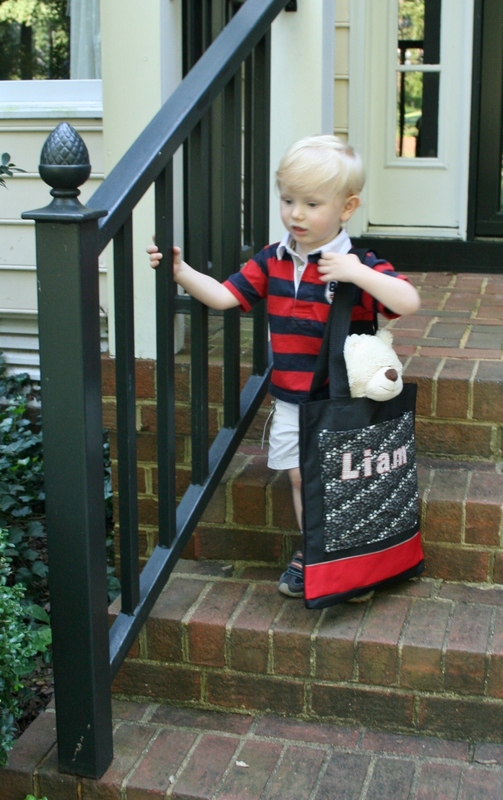 I think I might have to put a tuck in the straps since they are a little to long, but otherwise he seemed very happy with his personalized tote bag.